Komsomolskaya station was constructed to act as a type of “gateway” to Moscow. Explore the treasures of the world’s largest underground museum. 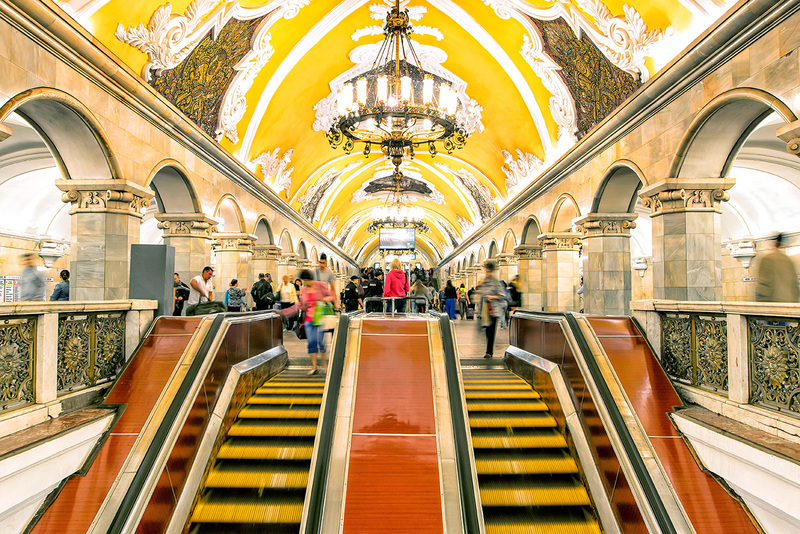 The Moscow Metro is known all over the world for being the largest underground museum. Many of the stations were luxuriously designed and decorated by leading Soviet artists and sculptors in the Stalinist Empire style as a demonstration of the power and wealth of the Soviet Union. At the center of the map of Moscow’s metro system there is a ring line, consisting of 12 stations with continuously running trains that circle the heart of the city. This line was constructed following the Second World War, and the decoration glorifies the military might of the Russian people. Almost every station has architecture of cultural significance. In order to experience the art, you only need to enter the metro one time. As you ride around the ring line, exit the metro car, take some time to view the art and architecture at each stop and, without transferring or exiting the station, get on the next train until you reach the next stop. RBTH is ready to guide you on this tour of the five most interesting stations of this underground museum. This station leads to Moscow’s main park, Gorky Park. The station includes five types of marble, from veined light gray to black, and other features, such as empire chandeliers and marble bas-reliefs. These bas-reliefs were made according to the sketches of Isaac Rabinovich, who also decorated the USSR pavilion at the 1939 World’s Fair in New York. They depict the labor and leisure activities of the Soviet people, as well as the types of activities they participated in at the famous Gorky Park, including flying model planes, dancing and playing football and tennis. Medieval architecture is the main theme of this station's design. Intersections of arches create a kind of cross vault similar to those found in Russian boyar chambers from the 13th to 16th centuries. The pillars are generously decorated with majolica panels, in the style of the studio of Andrea della Robbia, the famous Florentine sculptor of the 16th century. However, instead of featuring images of Madonna, you will find profiles of heroes of the Soviet Army, such as sailors, tank operators and pilots, basking in glory with victorious banners and bayonets, painted with enamel and gilding. This station was constructed to act as a type of “gateway” to Moscow because it is located under the three busiest Moscow railway terminals. It represents the peak of the Stalinist Empire style with its elegant bronze chandeliers, marble arcades and monumental mosaics made from smalt. Today, the station is adorned with eight mosaic panels, designed in the style of ancient temple architecture. They depict famous Russian warriors, commanders, and the leader of the Russian Revolution, Vladimir Lenin, who is portrayed giving a speech in Red Square. This is one of the most ceremonial stations in the Moscow Metro. It is best known for its 32 stained-glass panels, which were all designed by the famous Soviet artist Pavel Korin. The stained glass windows were made in Latvia, according to Korin’s sketches, because Russia did not have a tradition of working with stained glass or any masters of the craft. Before its opening, the architects were afraid that Muscovites would associate the station with Catholic churches, but instead, they found that residents likened it to an incredible underwater world. Six of the stained-glass panels depict people from different professions including a musician, an agronomist and, of course, an architect. The remaining 26 panels contain intricate geometric patterns and stars. This was the last station to be built on the Moscow Central Ring. It was built under the personal supervision of General Secretary Nikita Khrushchev, who initiated the Soviet "thaw" policy and dismantled Joseph Stalin's cult of personality. It is believed that the elegant decor was a way for Khrushchev to pay tribute to his Ukrainian homeland. Following the opening of the station, the Soviet leader declared a "war" on excesses in architecture, thereby ensuring the unrivaled glory of this underground “palace.” Its lobby, like those at some other stations, is decorated with marble and granite, and the columns are decorated with 18 mosaic panels in the Florentine tradition. These bas-relief panels tell the history of relations between Russia and Ukraine, from the time of the Pereyaslav Rada in 1654 (when the Cossacks swore an oath to the Russian Tsar) to the October Revolution in 1917. The titles of the panels speak for themselves with works entitled: Pushkin in Ukraine, The Liberation of Kiev by the Soviet Army in 1943 and The Friendship of Russian and Ukrainian Collective Farmers.